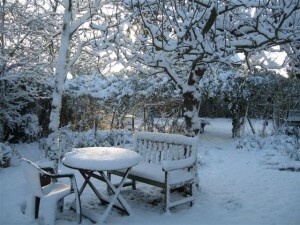 As these photos show, here in the south of England we have had heavy falls of snow and the garden looks so lovely in the wintry light that I couldn’t resist venturing outside with my camera. 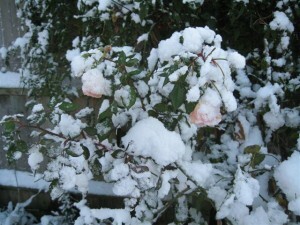 In the second photo, the very last roses are flowering bravely amidst a blanket of snow. As the year starts to draw towards its close, I’ve been looking back over the months since my website was set up just over a year ago and reflecting with pleasure on the added dimension it has brought to my life. I have been both surprised and delighted to make contact with so many fellow dyers all over the world and I’d like to thank you for following my blog and sharing your experiences with me. I really value your comments and the links to other websites and blogs, some of which have opened up new areas of interest and experimentation for me. I would also like to thank those of you who have supported my efforts to persuade the publishers to reprint “Wild Colour”. I am still waiting to hear whether we have been successful and I will let you know of any developments in the New Year. As I write this we are preparing for the arrival of various family members, including our dear granddaughter, now 18 months old, who will be spending the holiday period here with us. So this will probably be my last post until January and I wish everyone a very happy Christmas and all the very best for 2010. During the past few weeks I have been in correspondence with an Austrian, Rupert Kampmueller, who is working with a group of basketmakers in Rubona, Uganda. 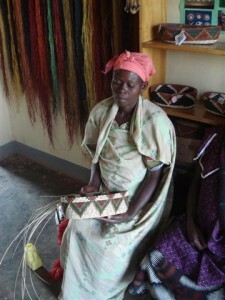 The ladies in Rupert’s group make beautifully patterned raffia baskets and also some other items, all dyed with natural dyes. Rupert’s main query concerned possible ways to use the fresh leaves of Indigofera arrecta, which grows wild in the area of Uganda where he is working. I am hoping that the methods for using fresh woad leaves can be adapted for obtaining blues from Indigofera arrecta and I look forward to hearing whether he has been successful. If anyone else has any further suggestions for obtaining blues from fresh Indigofera arrecta leaves, I’d be delighted to pass the advice on to Rupert. 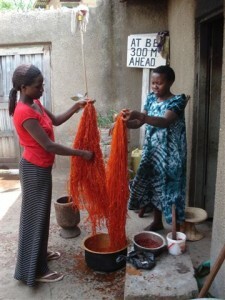 In addition to using some local dyes, the ladies also use madder and weld to dye the raffia and I suggested that they might try using local sorghum leaves, which are used to produce reds in many parts of Africa and for which I have sent Rupert some dyeing tips. 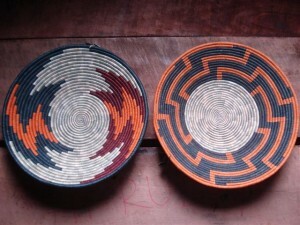 The designs on the baskets are traditional ones and Rupert and his dyers have created a wide range of strong natural colours to dye the raffia used by the weavers. 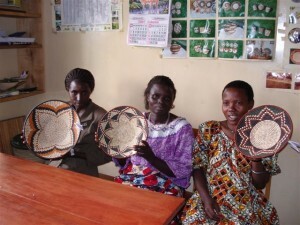 For more details of the basketmakers and the organisation supporting them, look at the website www.fullcircletrade.com/producers and click on the link to Rubona Weavers. 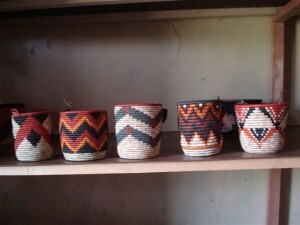 The following photos, sent to me by Rupert, show some of the baskets and their makers and also some of the dyed raffia. 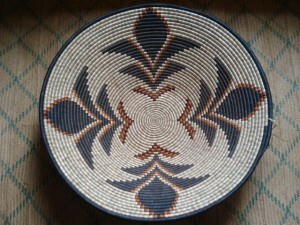 The raffia in the centre was dyed with fresh woad leaves and the black colour on either side was achieved using the tannin/iron complex. 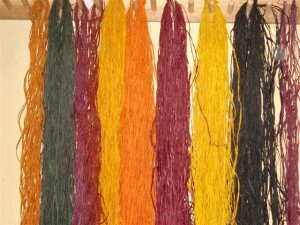 These colours were the result of some test dyeing done by Rupert, while he was at home in Austria before returning to Uganda. 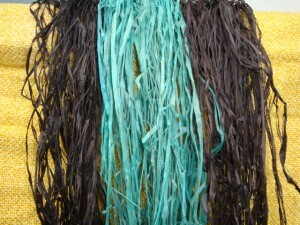 These hanks of raffia show some of the naturally-dyed colours achieved using local plants and also weld and madder.